Some of the most highly specialized dental handpieces in the industry, Kavo handpieces are machined to tolerances typical of only the most advanced engineering practices. The Kavo Super Torque is an excellent example of what the company does best. While machining to a perfect fit requires talent, it's only half the battle. The turbine must be balanced, and perfectly seated to complete the work. Highspeed air driven Kavo handpieces incorporate rotors with unmatched concentricity, and impellers designed for maximum balance and efficiency, while spinning at speeds approaching 500,000 rpm. 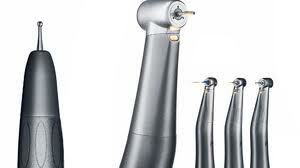 The Kavo 642 Bella Torque handpieces are a favorite of those who appreciate the higher speeds in a standard head size. At 420,000 rpm the Bella Torque provides speed and power while avoiding the high pitch, a testament to the well balanced handpiece turbine. Operating at fractions of a millimeter from stationary components inside the handpiece head, Kavo turbines utilize air like it's $3 a gallon. Kavo handpieces house a turbine specifically machined to match, gaining maximum efficiency from each cubic foot of supplied air. The Kavo 6500 series handpieces reflect the perfect combination of speed and balance. At 400,000 rpm, the quiet operation (57dB) provides evidence that air energy is being put to work with minimal exhaust. Exhaust is a major contributor to handpiece noise. Kavo low speed handpieces are among the highest rated, with excellent resistance to wear and breakdown. Again, vibration is key here as well. While low speed for the dental industry typically involves 5,000 to 20,000 rpm, these speeds would be considered high in any other application. The Kavo Intra series is a common choice for dentists seeking top of the line equipment in this category. With the addition of replacement heads and attachments available from Kavo and others, such as Nakamura, the combinations which can be achieved with the Intra low speed Kavo handpieces is virtually limitless. Kavo handpieces aren't just leading the class, they're teaching it. Much of the success attributed to Kavo handpieces is due to the company's ability to zero in on market demand, and in many cases, create that demand with innovative tools. A close relationship to participating dentists with an interest in the advancement of their equipment keeps Kavo ahead of the curve.